Emma-Marie is an active performer of baroque and contemporary music; known for her vibrant yet sensitive interpretations recent concerts have included performances of concertos by Vivaldi and J.S. Bach with orchestras in Italy, England, Sweden and Moldova. She recently completed a concert tour of Transylvania performing works by J.S. Bach alongside contemporary music and improvisation. Currently based in Moscow, Emma-Marie is the artistic director of Globus Music baroque ensemble and works with artists of the Bolshoi Theatre and ballet dancers to create innovative performances that fuse early and contemporary art forms. Danish-British violinist Emma-Marie Kabanova began her musical education at Goldsmith’s College, University of London studying performance and composition and completed her classical violin studies at the Novosibirsk Conservatory in Siberia. 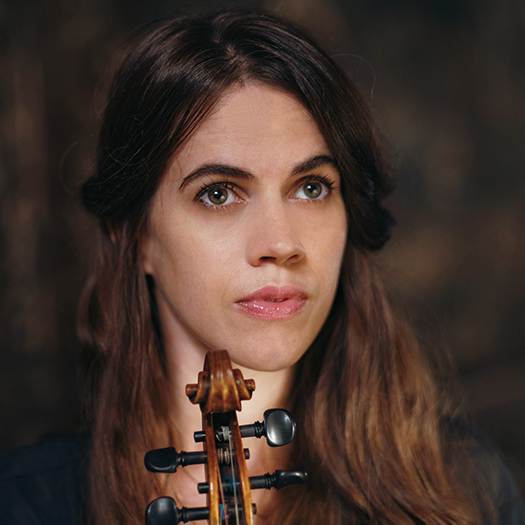 She has been performing as a baroque violinist since 2016 and has studied historically informed performance practices in Sweden, Austria and at the Academia Antonio Vivaldi in Venice, Italy. Music composed by Emma-Marie has been performed by the London Philharmonic Orchestra and artists of the Bolshoi Theatre and she often performs her own compositions and improvises in solo recitals. Fluent in historical and contemporary forms of improvisation, Emma-Marie teaches improvisation at the Crescendo Summer Institute in Hungary. Besides these activities, Emma-Marie has created many educational musical projects with vulnerable people in Russia and spent 18 months teaching music in a juvenile prison in Moscow. In 2017 Emma-Marie Kabanova was presented with a “Points of Light” award by the British Prime Minister in recognition of these activities.